Free download RoboForm latest version 8.4.6. Download RoboForm new version from the fast speed direct download link. RoboForm Password Manager is very outstanding system utility for your computer. RoboForm Password Manager is related to internet and save your user ID and password for various websites. This application works as plugin, extension or add-on for your web browsers. RoboForm Password Manager not only save your ID and password but also capable to save a complete form filled by you on internet. You can easily install the setup of RoboForm Password Manager. First of all, download the setup file from the link given below. After downloading, run the setup to install this on your computer. 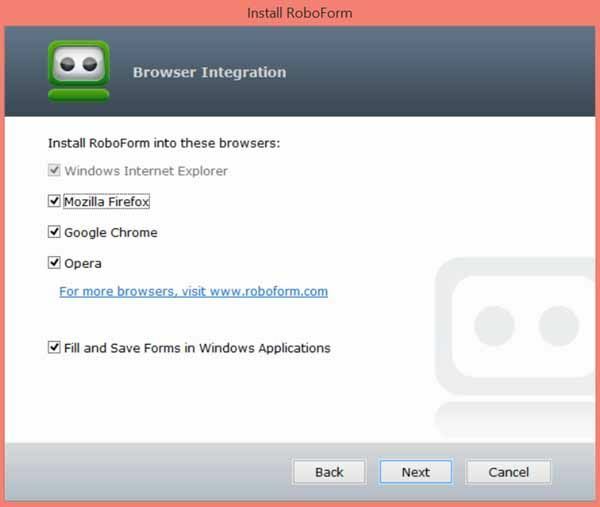 During the installation process, RoboForm will require you the option to use it from everywhere using internet or just from your Desktop. If you want to use it from everywhere then you have to create an online account with RoboForm website. You can set your ID, password etc and then you are asked for Master Password. Master Password will be required each time you will use autofill or add more form with RoboForm extension. You must remember the Master Password as if you forget it, you will fail to recover it. After this process, extension or add-on will be added to your browsers. If it does not appear with Google Chrome, you can add it form More Extensions by search RoboForm. When you will add this extension, it will require your ID and password. Provide the user ID and password that you have entered during the installation. Now you will see the more options with it. This includes Logins, Identities, Safenotes and more options. When you will login to any account, RoboForm will ask you to save the details just below the address bar. You can save it with the name of website.